Jamilah Salvador was walking in her first ever Pride parade this weekend in the Philippines when she came across something unexpected at the finish. 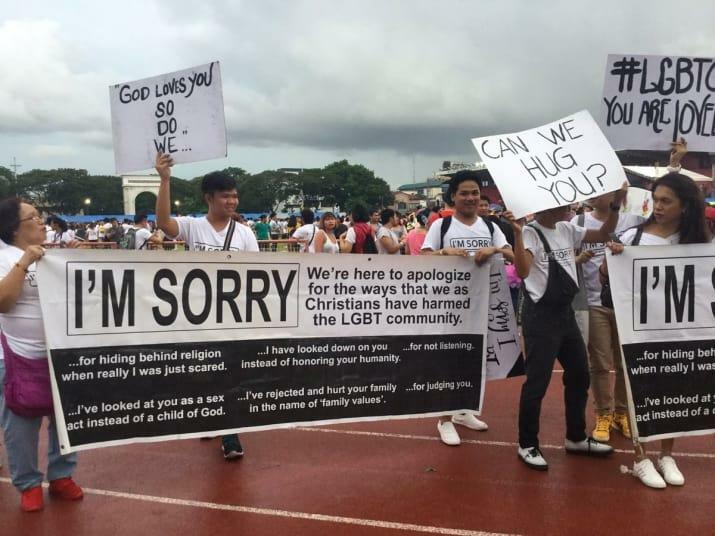 Christians were holding signs apologizing for ways the religion had hurt the LGBTQ community. The 19-year-old was marching with thousands of others in the annual parade in Marikina City, east of the country's capital, Manila. The parade came to a close at Marikina Stadium, where Salvador was pleasantly surprised by the Christian group. "My heart really felt light upon seeing them," Salvador told CBS News. "I stopped when I saw them and read all of their messages and immediately felt goosebumps all over my body, then my tears started to build up." The main banners held by the group listed the ways "Christians harmed the LGBT community," including statements, such as "I've rejected and hurt your family in the name of 'family values.'" The other individual signs varied with messages like, "God loves you, so do we," and "I used to be a Bible-banging homophobe Sorry!!" Salvador said, "people absolutely loved" the group's display, explaining that many marching in the parade had intense reactions to the messages. The teenager told CBS News that some "started bursting into tears upon seeing the signs. Some hugged and talked to these Christians. Some took photos, like what I did, and others just stood there in awe." The photos that Salvador snapped and then posted on Twitter quickly went viral, along with other attendees images. The group who brought the signs to the parade is from the Church of Freedom in Christ Ministries (FICM), an Evangelical and Pentecostal church in Makati, Philippines, reports BuzzFeed News. The church's pastor, Val Paminiani, said that he has been going to Pride parades for around four years as a part of the organization's "I'm Sorry" campaign. Paminiani told BuzzFeed News, "We are apologizing for the way Christians have hurt the LGBT community, especially by using the Bible in condemning and judging them." The pastor continued that, "I used to believe that God condemns homosexuals, but when I studied the Scriptures, especially the ones that we call 'clobber Scriptures' that are being cherry-picked from the Bible to condemn LGBT people, I realized that there's a lot to discover, including the truth that God is not against anyone. God does not discriminate against people based on gender." Paminiani stated that he hopes other Christians will not utilize Scriptures to condemn the LGBT community, because it is keeping people from participating in the church and from Jesus, according to BuzzFeed News. "We pray that more and more Christians will act, speak, and love the LGBT people like Jesus would," he said. If Salvador's reaction is any indication that the pastor's campaign is impacting the community some Christians condemn, this church is fulfilling its mission tenfold.